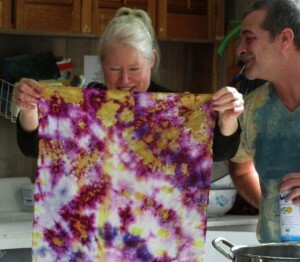 An April workshop with Pavlos Mayakis at the Mendocino Art Center (MAC) was on over-dyeing fiber reactive dye with vat dyes – two chemically different systems – to create brilliant areas with halos where the colors met. 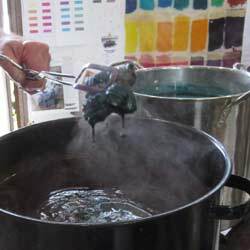 After soda-soaking and dyeing fabric with fiber reactive dyes, we worked with methods for tying and clamping resists. On the left, the workshop in action in the Textile and Fiber Studio. On the Sunday, the final step, which was surprisingly quick, was to tie or clamp the fabric and put the bundles in the Aljo vat dyes for 5 to 15 minutes. The new colors replaced the fiber-reactive colors that weren’t protected by resists, leaving white halos. On the right, workshop instructor Pavlos Mayakis with finished fabric piece. Piece of my fabric from the halo workshop. 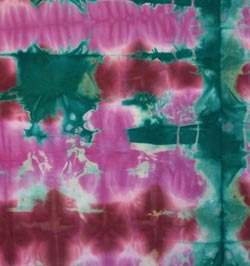 Dyed first with red and magenta fiber reactive dye, then tied and dyed in green vat dye. 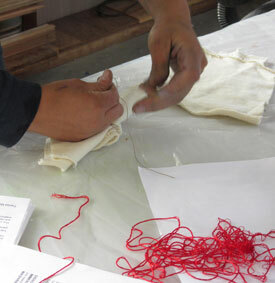 Tying some of the original white fabric for the fiber reactive dye. 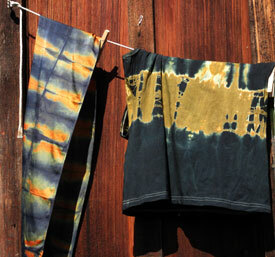 Dyed fabric that has been retied and is going into the vat dye. 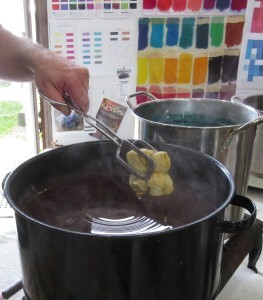 Taking bundle of fabric from the vat dye. The same bundle as it looked when it came out of the vat. The one on the left was shown above, going into/coming out of the vat dye. Jan opening up her first finished piece. 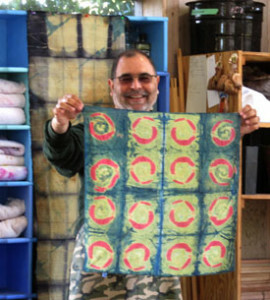 Ben with one of his over-dyed works. 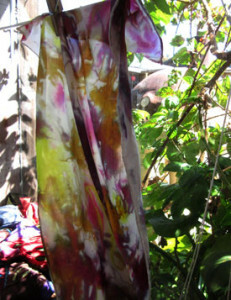 An over-dyed silk scarf hanging in the window of the Textile and Fiber Studio.